It’s like an addiction, and it’s something that businesses have noticed. Brand stories have become a common marketing tool, with businesses striving to understand and communicate their message through storytelling. Even services have started to tailor their experiences to embrace stories as a way to connect people. The latest in this is Facebook, who have added a Group Stories function as a ‘call to action’ for their users, encouraging them to share and communicate more on the platform. As the popularity of this new service grows, we wanted to explore the popularity of stories in marketing, and why they have the power to engage customers the way they do. Brand storytelling isn’t a new idea. It’s been around for years, but for a long time, it was only bigger businesses who were bothering to engage in it. It’s the main reason that the John Lewis Christmas adverts get so much attention every year – they tell a story in the space of a couple of minutes. And not just any story, but a fully-fledged, heartwarming story that sends a clear message. In a couple of minutes. That’s pretty impressive. But why does John Lewis put so much time, effort and money into this story year after year? Because human beings crave stories. We can’t help it. It’s just the way we’re wired. Various neurological studies over the years have discovered that the human brain is far more engaged by storytelling than by cold, hard facts. This is because when we read facts and data, only the language centres in our brains are activated – to help us understand what we are reading on an intellectual level. But when we read a story or even certain words, we can activate other parts of our brains as well. For example, works like ‘lavender’, ‘cinnamon’ and ‘soap’ all elicit a response from not only the language processing area of the brain but the parietal lobe too (the bit that controls smell). When we read a story that has descriptive words like these in it, we are activating all sorts of different areas in the brain, as if we were actually experiencing the event the story is telling. It’s why a good action film can increase your adrenaline or testosterone, or a well-written book can make you cry. But here’s where it gets really interesting. When we read these stories and activate all these different parts of our brains, the stories imprint themselves on us, as if we had really experienced them. This makes them easier to remember in the future and creates a very strong connection with the story in question. In fact, we have such a strong connection to stories that our brains are constantly creating them to fill in the gaps. We spend around a third of our time daydreaming or making up narratives about other people’s lives (if you enjoy people-watching, you know exactly what we mean), and the only time we stop daydreaming is when there’s a great story in front of us. All of that is well and good, but what does that mean for your business? It means that if you want to get the attention of your customers, you need to give them a good story to connect with. Over the years businesses have come to realise this, and with the advent of social media, it’s become even more important. Show Off Their Personality: In an age where ‘people buy people’, personality in marketing has never been more important. A good narrative is a great way to shine a light on your unique brand voice and give your customers something to connect with. Ultimately, your brand personality is what keeps people buying from you. If you have no personality, then you are no different from your competition. Stories help you reveal what makes you different. In other words, storytelling is what links the brand with the story’s values. And whatever story you’re telling, your brand will be lined with that message. This gives you a platform to position your brand wherever you want it to be. Hit The Emotions Hard And Forge Real Connections: People love the John Lewis adverts because they make them feel something. Whether that’s a sense of loss, the need to reach out to loved ones or a feeling of joy, you can’t watch them without feeling something. When we feel a strong emotional response to something, we are more connected to its message. So if you can create that emotional response in your customers, they will feel more engaged and attached to your brand as a result. Get Their Readers Hooked On Their Message: If there’s one thing we human beings can’t resist, it’s a good cliff hanger. With a storytelling campaign, you can create a story that never ends, keeping your audience hooked on your marketing and getting your message embedded in their subconscious and conscious mind in the process. 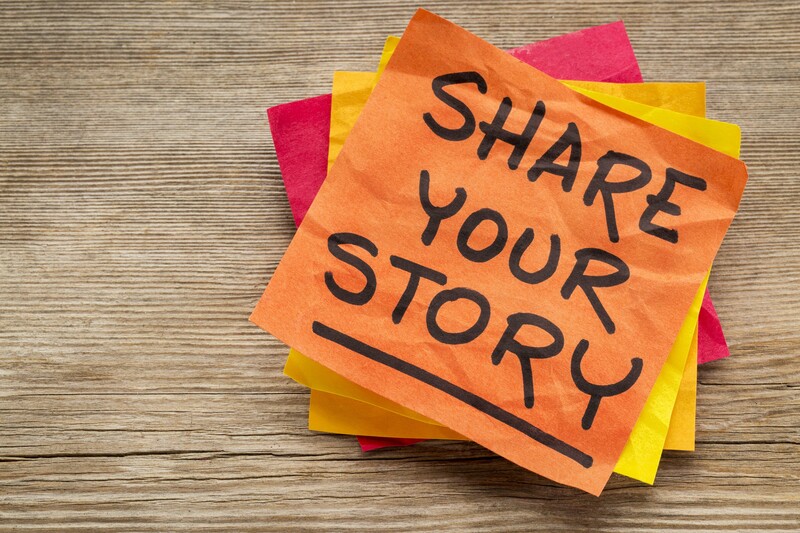 How Can You Use Stories? Dove Men+Care: Dove sells soap. It’s a functional thing we use every day and couldn’t possibly have a story behind it, could it? Wrong. Earlier this year Dove launched the campaign that people are still talking about today. Dove has been using storytelling in their marketing for a while, using real stories from customers (and not supermodels) to help women identify with their brand. But they have traditionally been stories from women. This year, Dove harnessed the power of a dad wanting to see his child. The story tells us about something that stirs up emotion, and then links those emotions to the healing, reuniting power of soap. You can watch the video here. Always #Likeagirl: Always has always been great at getting their point across, loud and clear. The brand has often sent messages of empowerment, but nothing hit home quite as much as this. In 2014, Always started the hashtag #Likeagirl, promoting the fact that women and girls shouldn’t be influenced by societies expectations of them. Inspired by playground slurs of ‘you throw like a girl’, the campaign is a powerful and uplifting look at how the phrase should be used to show strength, not weakness. You can watch the video here. TOMS: TOMS makes shoes. Shoes can easily tell a story because they are part of a journey, so there is some nice mileage to be had there. But in 2011, the founder of TOMS started a campaign, asking everyone to go barefoot for a day, to raise awareness for the more unfortunate in the world who lived every day like this. The whole campaign was done through storytelling and interactive social events, getting customers to send in photos and participate in the campaign. They then revealed that for every pair of shoes a customer bought, TOMS would donate a pair to a needy child. Unsurprisingly, it was a huge success and is now an annual event. You can find out more here. So what can we learn from this? That storytelling is the single most powerful marketing tool, at your disposal as a business, and when done well, it can catapult you into the mind’s eye of your customer. But it has to be done right. That takes time, effort and skill, and as a business owner, those are things you might not have a lot of. If you don’t then why not hire someone who does? At Orbital Media, we help businesses craft their own story, create amazing campaigns and share their story with the world. If you would like to know more, please just get in touch today.